Enemies: Betty Brant, Foreigner, Spider-Man, perhaps Killer Shrike and who knows how many others? 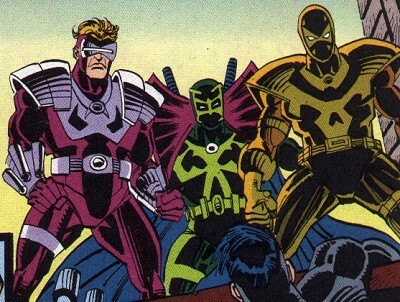 Powers/Abilities: They wore special suits that granted them a high level of protection and/or firepower. It's not clear if their special abilities derived from the treatment they underwent in the Foreigner's lab, or from their equipment or both. The special abilities were: enhanced speed and/or reflexes, enhanced or super strength, and/or the ability to absorb all the noises in a radius of at least 20 meters. Some of them were also probably trained in martial arts, hand to hand combat, and in the use of several weapons, ancient and modern. They also had cerebral implants that transmitted the information of their battles to the Foreigner's lab; they also had an self-destruction device. (Web of Spider-Man#92 (fb) - BTS) - The Foreigner created the Death Squad. A lot of his agents wanted to acquire super powers, and the business of killers with super-powers was remunerative. His technicians created special costumes that gave their wearers super-powers. (Web of Spider-Man#91 (fb) - BTS) - Betty Brant started an inquiry about the death of his husband, Ned Leeds, and went to work to the Foreigner's center in New Jersey. (Web of Spider-Man#92 (fb) - BTS) - The Foreigner discovered Betty but knew that existed a link between Betty and Spider-Man, so he decided to use her to attract Spider-Man's attention. He wanted to use the hero as a test for his Death Squad. (Web of Spider-Man#91) - Killer Shrike knew too much information about the Death Squad and the Foreigner's 1400 Club of assassins, so he hid from them, sure that they would kill him if they found him. (Web of Spider-Man#91 (fb) - BTS) - Two months after Betty Brant started to work in the New Jersey center, the Foreigner decided that she had gathered enough information, and he sent the Death Squad to kill (or to threaten) her. (Web of Spider-Man#91) - Pulse-2 and Whisper-3 went to Betty's flat at Forest Hills. They didn't find her, but to cover their presence Whisper had to kill a witness. (Web of Spider-Man#91) - The next day they found Betty Brant and assaulted her while she was in a restaurant. They were stopped by Spider-Man who tangled with Whisper, managing to have Whisper blasted and killed by Pulse. Pulse transmitted Whisper's and his abilities to the Foreigner's labs and then self-destructed themselves. (Web of Spider-Man#92) - Hans and another subject underwent the treatment to become the new Pulse-3 and Silence-1. The foreigner decided that the Death Squad had to do another test. That night they waited for Betty Brant and Spider-Man at the Foreigner's base in New Jersey. This time also Swift-1 and Warfare were in the Squad. The fight was longer, but eventually Spider-Man defeated them. Warfare activated the self-destruct so the hero had to flee with Betty Brant before finding evidence against the Foreigner. (Web of Spider-Man#92 - BTS) - Probably Swift-1 was only wounded and managed to flee from the explosion that destroyed the Foreigner's base in New Jersey. (Spectacular Spider-Man II#209) - A new Boss took the leadership of the 1400 Club; he named the Foreigner a traitor and sent Pulse-4, Silence-2, and Swift-1 to kill him. (Spectacular Spider-Man II#209) - The assassins waited near a warehouse where two of their colleagues had been killed by Foreigner the night before, and they spotted the Foreigner and attacked him. 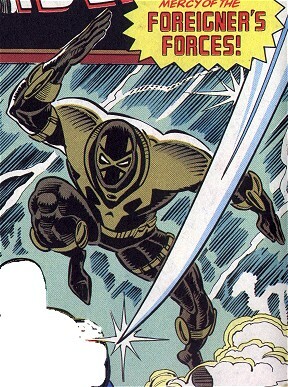 Silence-2 was killed by the master assassin, but Pulse and Swift-1 were murdering Foreigner when Spider-Man saved him. Pulse was killed when his self-destruct device was activated by Foreigner, and Swift-1 fled. Shortly later Swift-1 was found by Dead Aim who executed him for his failure. Comments: Created by Howard Mackie, Alex Saviuk and Williamson/Stegbauer/Milgrom. Pulse and Silence killed by Foreigner are probably Pulse-4 and Silence-2 but could also be Pulse-44 and Silence-88, considering the high percentage of death of his agents. Silence-1 was never named. I always thought to him as Whisper-4. However, Spider-Man thought of him as Silence during the battle in Foreigner's attic. Maybe Betty Brant knew the assassins battle-names and had told them to Spider-Man them before the battle. 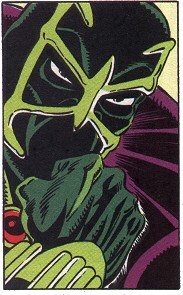 Or Spidey simply nicknamed his adversary "Silence", and the followers took this name just for coincidence. Killer Shrike could also have been another test for Spidey. But his paranoia seemed real; he could also have been frightened by another "them" different from the 1400 Club. These guy's modus operandi remind me of Humanity's Last Stand's "Mutant Liberation Front." or to any other "Death" character or any other "Squad" group or with a similar name. or to any other character with a similar name. or to any other "Silent" or "Silence" character. or to any other "War" character or with a similar name. 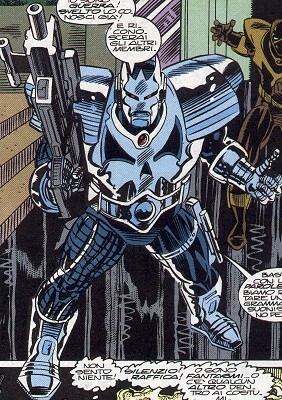 Pulse-2 wore armor that enabled him to blast impulses of energy of varying intensity. They could stun or kill a man or melt a flooring. He also had super-strength enabling him to rip Spider-Man's web. The Pulse equipment has a radio transmit/receiving device, a self-destruct device, and the capability of transmitting all the data learned by the armor (and the man in the armor) to the Foreigner's labs, where they would have been used to create the next succeeding and improved Pulse. Pulse has also a good hand-to-hand fighting skill. 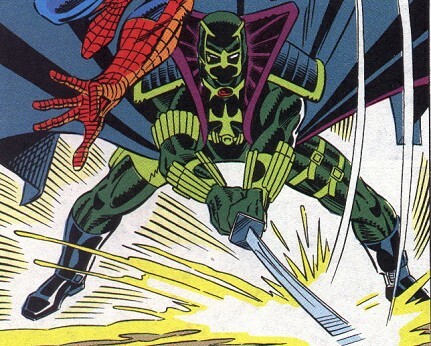 (Web of Spider-Man#91) - Pulse-2 was probably the second assassin to wear that costume, and the first one likely died in a previous mission. He and Whisper-3 went to Betty Brant's flat to frighten Betty Brant and attract Spider-Man's attention. He only made a big hole in the door because they were interrupted by the arrive of a witness. Betty Brant wasn't there. (Web of Spider-Man#91) - The day after, he and Whisper-3 attacked Betty Brant in a restaurant. After a few moments Spider-Man appeared, and Pulse-2 immediately hit him with his blasts that knocked down the web-slinger for a while. Pulse-2 shot another blast, thinner and more concentrated, that slightly wounded Spider-Man, then shot at full power the arachnid, but only hit the ground, melting it. In the following struggle, Spider-Man succeeded in pulling Whisper-3 on the line of Pulse-2's fire. Whisper died and Pulse-2 stopped the fight and the aborted the mission. He transmitted the Whisper-3's and his data to the base, then activated the two self-destruct devices and waited. He died in the explosion. Pulse-3 had the same powers of Pulse-2 plus unspecified improvements. (Web of Spider-Man#92 - BTS) - The man who would have become Pulse-3 was part of the Foreigner's organization. He was a volunteer for entering into the Foreigner's special squad and was well-paid for his work, but knew nothing about his predecessors. (Web of Spider-Man#92) - After Pulse-2's death, he and Hans underwent to the empowering treatment that lasted a hour and was rather painful. (Web of Spider-Man#92) - That night, with the rest of the Death Squad he did a test. They attacked Spider-Man and Betty Brant. He tried to shoot at Spider-Man, but kept missing him and hit Silence-1 instead, killing him. He was knocked out by Spider-Man so couldn't dodge the Warfare's machine gun fire, so he died. Pulse-4 had the same powers of Pulse-3 plus some unspecified improvements. (Spectacular Spider-Man II#209 - BTS) - Pulse-4, Silence-2 and Swift-1 were sent by the new Leader of the 1400 Club to kill the Foreigner. (Spectacular Spider-Man II#209) - They waited on a roof near a warehouse where the night before the Foreigner had killed two other assassins. They surprised the Foreigner who attacked them. Pulse-4 avoided his attack and blasted him, missing him, but Swift-1 managed to hit the Foreigner, and Pulse destroyed his sword with a blast. They were finishing the Foreigner when Spider-Man kicked them from behind. Pulse-4 tried to hit the wall-crawler and was really surprised when Spider-Man jumped just before the shot. Then he was kicked again by Spider-Man. Momentarily stunned, he was blocked by the Foreigner who activated the self-destruct command. Pulse-4 died in the explosion. Silence-1 had the same powers of Whisper-3 plus unspecified improvements. He was created to be stealthy and shrewd. Silence-1 had an armor that enabled him to absorb noises of varying intensity, from the voice to the explosions. The armor was also bullet-proof. The Silence-1's equipment has a radio transmit/receiving device, an self-destruct device and the capability to transmit all the data learned by the armor (and the man in the armor) to the Foreigner's labs, where they would have been used to create the following and improved Silence-2 (or Whisper). Silence-1 has enhanced reflexes and strenght, has two swords (katana) and probably other oriental weapons. He also probably is as well-trained in martial arts as the previous Whispers. 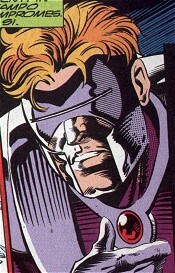 (Web of Spider-Man#92 - BTS) - Hans, the man who would have become Silence-1, was part of the Foreigner's organization. He was a volounteeer for entering in the Foreigner's special squad and was well-payed for his work, but knew nothing about his predecessors. (Web of Spider-Man#92) - After Whisper-3's death, he and Hans underwent to the empowering treatment that lasted a hour and was rather painful. (Web of Spider-Man#92 - BTS) - That night, with the rest of the Death Squad Silence-1 did a test. They waited at the Foreigner's New Jersey Center for Brant and Spider-Man. (Web of Spider-Man#92) - The two arrived. The assassins attacked Spider-Man and Betty Brant. Immediately, Silence-1 absorbed all the sounds. In the struggle, he launched a sai to Spider-Man but stabbed Swift-1, instead. Spider-Man get confused by the missing of the sounds (and probably of his own ever-talking voice), so avoided Silence-1's katana and catched him, using him as a human shield. Pulse-3 shot a blast that passed through Silence-1, killing the assassin, but missing Spider-Man. After the fight, Warfare activated his self-destruct device, and he explosion destroyed all the evidences. Silence-2 had an armor equal to the Silence-1 costume and probably the same powers but improved by unspecified abilities and quantity. (Spectacular Spider-Man II#209) - They waited on a roof near a warehouse where the night before the Foreigner had killed two other assassins. They surprised the Foreigner but he was the first to attacked them. Silence-2 was hit by Foreigner and grabbed him in a strong catch but Foreigner succeeded in grabbing a katana and slashing Silence-2. He died, killed by his creator. Swift-1 had enhanced speed and reflexes, near those of Spider-Man. His costume has a radio transmit/receiving device, and probably a self-destruct device and the capability to transmit all the data learned by the armor (and the man in the armor) to the Foreigner's labs, where they would could have been used to create the next improved Swift. (Web of Spider-Man#92) - The Foreigner organized a test for his Death Squad involving Spider-Man. One night, Swift-1 and the rest of the Squad waited for Betty Brant and Spider-Man at the Foreigner's base in New Jersey. Swift-1 was the first to attack the objective. Despite his Spider-sense, Spider-Man had to defend Betty Brant amd was kicked by Swift-1. The assassin didn't injure the Wall-crawler and was dodged by him at the second attack. All the Death Squad attacked and Spider-Man had to get Betty Brant to safety, so couldn't avoid Swift-1's kamikaze-catch. But Spider-Man succeeded in having Swift-1 hit in the throat by one of Silence-1's sais. Spider-Man believed him dead and, when Warfare activated the self-destruct device, the hero fled with Betty Brant, leaving the Death Squad in the explosion. (Web of Spider-Man#92 - BTS) - Probably Swift-1 was only wounded and managed to flee before the explosion that destroyed the New Jersey Foreigner's base. (Spectacular Spider-Man II#209) - A new Boss took the leadership of the 1400 Club; he claimed Foreigner a traitor and sent Pulse-4, Silence-2 and Swift-1 to kill him. (Spectacular Spider-Man II#209) - They waited near a warehouse where other two assassins were killed by Foreigner the night before, and they spotted the Foreigner and surprised him. Pulse-4's blasts pulled Foreigner into the right position to be struck by Swift-1. Disarmed by Pulse-4, Foreigner was saved by Spider-Man who kicked the two assassins. While Swift-1 tangled with and was distracted by Spider-Man, Foreigner caused Pulse-4 explode. Swift fled from the fight. Shortly later Swift-1 was found by Dead Aim who disintegrated him for his failure. Warfare wore armor that granted him an unspecified degree of protection and a good degree of fire-power. His armor had a radio transmit/receiving device, an self-destruct device and the capability to transmit all the data learned by the armor (and the man in the armor) to the Foreigner's labs, where they could be used to create the next improved Warfare. He liked to use a machine gun. (Web of Spider-Man#92 - BTS) - That night, with the rest of the Death Squad Warfare performed a test to measure their skills. They waited at the Foreigner's New Jersey center for Brant and Spider-Man. (Web of Spider-Man#92) - When the two arrived at the Foreigner's office in the attic, Warfare immediately tried to kill Spider-Man and Betty Brant with his semi-automatic cannon. Spider-Man danger-sense and his reflexes saved them both. Warfare and Swift-1 went out the shadows and so did the rest of the Death Squad. A chaotic fight started, but Warfare kept missing Spider-Man, smashing walls and windows, too. Shooting at a wide angle he also killed Pulse-3; Spider-Man was angered and punched Warfare, stunning him. Shortly after, Warfare, understanding that the mission was compromised, started the transfer/self-destruct sequence. Spider-Man and Betty Brant fled, and the whole center exploded. After the fight, Warfare activated his self-destruct device, and the explosion destroyed all the evidences. 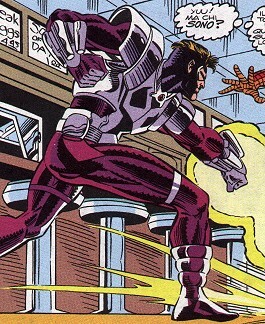 Whisper-3 had a suit that enabled him to absorb sounds of varying intensity, from the human voice to explosions. The armor was also bullet-proof. The Whisper's equipment had a radio transmit/receiving device, an self-destruct device and the capability to transmit all the data learned by the armor (and the man in the armor) to the Foreigner's labs, where they could be used to create the next improved Whisper (or Silences). Whisper had super-fast reflexes, usually had two swords (katana), knives similar to sais, shuriken, and probably other oriental weapons. He is probably well-trained in martial arts. He spoke in whispers. (Web of Spider-Man#91) - Whisper-3 was presumably the third to wear that costume. He and Pulse-2 went to Betty Brant's flat to attract Spider-Man's attention. Before they assaulted the flat, Whisper-3 neutralized all the sounds, so when Pulse-2 destroyed the door nothing was heard close by. A witness saw the assassins right then. Whisper-3 launched a sai and killed him. The two went away. (Web of Spider-Man#91) - The day after, Whisper-3 and Pulse-2 followed Betty Brant and Peter Parker in a restaurant. Whisper absorbed all the sounds, and Pulse shot a blast that smashed the local. Concealed in the smoke, Whisper approached Betty and Spider-Man appeared. Distracted, he was hit by a bullet shot by Betty; he fell, but he nonetheless absorbed both the noise and the impact. Whisper-3 and Pulse-2 were held back by Spider-Man and Betty until Whisper-3, thanks to his reflexes, could catch Spider-Man from behind. 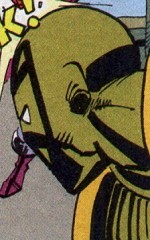 He was preparing to stab him, but Spider-Man pulled him into the line of Pulse-2's blasts. After few seconds he died. Pulse-2 activated the data transfer and the se;f-destruct, and both the men and the suits were destroyed in the explosion.